A few weeks ago, I received an e-mail asking if I was interested in conducting a review of “UNSEEN HAZARDS That Threaten Hunters, Campers and Hikers: What you should know about pathogens commonly found in wildlife ” by fellow Mainer Jerry Genesio. As a rabid outdoorsman, the subject area interested me greatly and I immediately said yes! 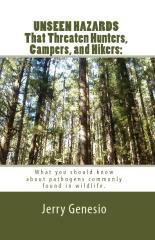 The book is an eighty-six page read containing information on six pathogens well know to most outdoor enthusiasts. Included are the backgrounds, associated symptoms and possible treatments related to rabies, lockjaw, rabbit fever, undulant fever, Rocky Mountain spotted fever and Lyme disease. Jerry’s twenty years working with biologicals have provided him with an in-depth understanding of zoological diseases and the steps that lead to their prevention. For individuals venturing into the wilds, the book is a great resource full of practical health wise advice. Poor Jerry didn’t know what he was getting himself into, as my exploration of his book had me e-mailing him question after question. Fortunately, Jerry is patient and very interested in taking the time to formulate organized and thoughtful replies. 1. Do you feel as a society we are vilifying the outdoors and making our kids afraid of venturing out the front door? - No, I don’t feel we’re creating unnatural fears in our children. I believe the fear is perfectly natural and very real. Having said that, however, I hasten to add it is fear that keeps us and those we love safe from harm. It is fear that keeps us from venturing too close to the edge, too far from the shore, too high in the tree, and too deep in the forest. We teach our children at a very early age to fear such recklessness. But we also teach them to safely appreciate panoramic views, the pleasure in being able to swim, the fun and fantasy of playing in a tree house, as well as the beauty and wonderment in the wild and wildlife. d. and the quotes by John Muir and Confucius printed on page 4 of the book. 2. Deet or Permethrin and why? - Of the six insect repellents judged by Consumer Reports to be most effective, the active ingredient in four is DEET, one is another chemical compound called picaridin, and one is oil of lemon eucalyptus. See the May 26, 2010, post on http://naturalunseenhazards.wordpress.com. 3. Are there any “natural” repellent products you would recommend? - Oil of Lemon Eucalyptus is the only plant-based product recommended by the CDC for protection against mosquitoes that carry West Nile Virus. The Repel brand plant-based Lemon Eucalyptus insect repellent just received a “recommended” rating from Consumer Reports. See my blog post of May 26, 2010 at http://naturalunseenhazards.wordpress.com. 4. What are the top three things hunters can do to avoid illness and infection? - In my opinion, the top three things hunters can do to avoid illness and infection are: (a) wear latex gloves when field dressing, skinning, and/or butchering game; (b) protect against mosquitoes and ticks by wearing insect repellent, dressing properly, and carefully inspecting for ticks; and (c) cooking wild game properly. 5. In Maine what is our biggest single pathological concern? - I believe our biggest single pathological concern in Maine, i.e., the one concern that currently puts most hunters at risk, is Lyme disease. In 2000, there were fewer than 100 cases reported in Maine. In 2009, there were nearly 900 cases reported in the state. “Researchers at the Maine Medical Center's Vector-borne Disease Lab track the progress of Lyme disease across the state by collecting and analyzing ticks. "We get 100 deer ticks off a single deer at a tagging station on opening day of hunting season," says Chuck Lubelczyk, field biologist for the Vector-borne Disease Lab. ‘Each tick, if you dropped it in the woods, could lay 3000 eggs apiece. So from one deer alone you could have 300,000 ticks next season.’ Small wonder the disease is spreading!” Lyme Disease Continues Its Spread In Maine by Bob Moore, Working Waterfront, 7/1/2008. 6. How should drinking water be treated? - I believe boiling for at least one minute is still the most effective way to treat drinking water. 7. You mention infection occurring in the skinning and preparation of animal meat; is it also possible to become infected gutting fish or even eating raw vegetables from the garden? - The digestive tracts of fish typically contain high levels of bacteria. Open wounds on the hands render anyone dressing fish or harvesting vegetables from the garden more vulnerable to bacteria. As for eating raw vegetables, one need look no further than the 2006 national recall of E. coli contaminated spinach. 8. Are there other pathogens on the rise that should be considered (Equestrienne Encephalitis, West Nile, Swine Flu, etc.) by outdoor enthusiasts? - The pathogens that concern me the most at this time are Eastern Equine Encephalitis (EEE), West Nile Virus, and Dengue fever. There haven’t been any confirmed human cases of any of these diseases in Maine yet, but we know that several horses in Maine have died of EEE, and last year Maine state health officials urged pheasant hunters not to expose themselves to the blood of pheasants, and to thoroughly cook pheasant meat, because it was confirmed that several flocks in the state were infected with EEE. Also, recent outbreaks of Dengue fever in Florida and Texas, and recent cases confirmed among U.S. missionaries and tourists visiting Caribbean islands are worrisome. For further details click on the Eastern Equine Encephalitis, West Nile Virus, and Dengue fever tags on my blog at http://naturalunseenhazards.wordpress.com. 9. Where can I order a copy of your book? - Unseen Hazards That Threaten Hunters, Campers, and Hikers is available through any bookstore in Maine that orders from Ingram, which is the overwhelming majority. It can also be purchased at the amazon.com link above. As an aside, I’ve also recently published a work of non-fiction titled Portland Neck: The Hanging of Thomas Bird . For details click the link above. You might also be interested in the book’s companion blog at http://portlandmainehistory.wordpress.com.